Damage: 4D6 for arrows shot from it and 1D4×10 for short spears shot when braced on ones feet. 1. Independent personality with an average to high I.Q..
2. Communicates through limited telepathy. 3. Totally indestructible; the bow and string can flex and bend as expected for such a weapon. 4. Made of blue grey metal and upon the flat sides there ar small engravings of scales not unlike a dragon. upon those scales almost to small to see is a single rune upon each of them! The “string” appears to be a thin braided metal wire. 5. Confers its damage upon the objects (arrows or short spears) fired from it. 6. Links itself to its wielder/owner within six months of constant contact. Thus, both Kankoran and weapon can sense each other’s presence within a four mile radius if separated. 8. Can be used only by a person of a particular alignment (good). Characters of a selfish or evil alignment take 2D4 points of damage each time they touch the weapon or 3D6 damage if a creature of magic. 9. Healing/Cleric abilities. Possesses all of the following: Heal wounds, 2D6 hit points and 2D6 S.D.C. (Healing can be performed six times per 24 hour period); Remove curse, 1-56% chance of success (once daily); Turn 4D6 dead, duration four hours, 1-55% chance of success (four times daily); Animate & command 2D6 dead, duration four hours, l-64% chance of success (two times daily). Personality: Azomir always introduces itself to a new wielder as “Azomir, the Unforgiven,” but never reveals why. Whatever earned it that title has (presumably) caused it to be quiet and reserved, seldom speaking to its wielder again after that. When Azomir does speak it is with a great reluctance, and only when something it feels is of great importance needs to be said. History: Azomir was originally commissioned and wielded by Sorazel Rhul, the last of the Clerics, during the Elf-Dwarf war. It is said that the destruction of her order drove her to forsake all her oaths in order to wield this weapon of vengeance against those responsible. The regret of this unforgivable violation of the Cleric way imprinted upon Azomir on purpose, so that the price of her vengeance would never be forgotten. 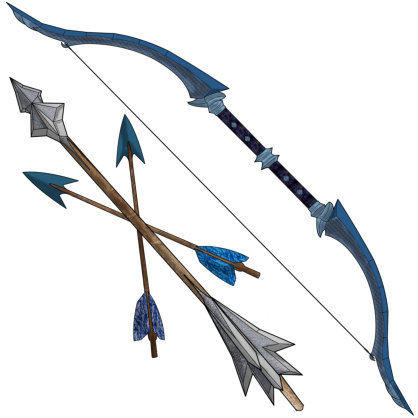 The rarity of a rune bow compared to lesser magical bows has made this weapon’s place in history and legend difficult to discern. There are a number of vague tales throughout history of heroes who have wielded a magical bow, and in any of those stories the bow in question could just as easily be Azomir. The last such tale possibly places it in the Northern Wilderness, somewhere within the disputed lands.